With the approach of Thanksgiving, my thoughts return to the table which I so customarily gathered around in my childhood. There in the small kitchen of my grandmother’s home was a simple maple table with 6 chairs around. To the eye there was nothing unusual about it, but the love and memories that always surrounded it fill me with warmth to this very day. Endless games of dominoes played, many great discussions weighed, numerous pies and casseroles made- family life had encircled its relatively small frame. On most occasions there was plenty of room, as family would come and go at various times. Sundays after church no one dared miss her homemade fried chicken and mashed potatoes or the dessert cooling on the back porch. And though it was a small home, surprisingly it rarely felt small. Yet for Thanksgiving and Christmas every square inch of space in my Grandmother’s home seemed in use, especially her table. As one of the youngest generation, I was always at the kid’s table. A fact that for many years I optimistically looked to change. Why you may ask? First of all, we were the last to be seated and fed. More than that, however, was that all of the interesting conversations seemed to happen at the adult table. Here, they shared their joys, sorrows, while supporting and challenging one another to stay the course. They told stories, jokes, laughed and cried.Through it all love, faith and hope remained. Before you knew it, all my wishing to be included at the adult table became a reality. My cousins and I were home from college and were even entreated to sit for a spell. This was it, I thought, now I am finally regarded as a grown up. What I did not pause to consider, though, was the graced responsibility that being present in these conversations entailed. These were not easy problems with a ready answer, but quite often required more listening than speaking and a great deal of prayer. Over the years, I have become a solid member at the adult table, now in the upper tier of my family. Looking back, I finally realize what all those years around the kid’s table had been for. Preparation. 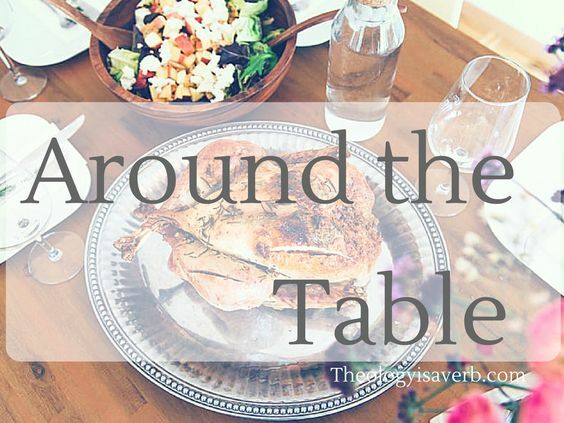 It was in that time spent with my cousins where we too had laughed, shared, and formed community that we would return to when we would later need to rely on one another.Thus thankfulness is for me found around the table. For more than the delicious food consumed there is the presence and gift of fellowship. Please take time this season to offer up praise for your place around the table, whether it be at your home or at another’s. Be willing to be vulnerable in your sharing , be generous in your listening, and merciful in your response. And always let prayer and love be your guide. Beautiful post! Thank you Elizabeth. Happy Thanksgiving! From our house(which sounds so much like yours) to yours, Have a Blessed Thanksgiving.